David Choe can’t seem to get enough of D Town. He passed through last week while filming his latest installment of “Thumbs Up”. Remarkably, not a single Denver resident lost a limb, or karma-points, during the course of his stay. Some may recall the Terminal Kings event held in early 2012 in which Choe joined street artists Highraff and Sam Flores for some good natured and propellant-powered live painting. Agents of the Poorly Kept Secret Society, then a better kept secret, were on hand. During that event, Choe decided to donate a mural to the City and County of Denver (with the help of his cohorts DVS-1 and Joe To). Those outstanding, towering paintings have lived at 13th and Champa for the past 18 months. 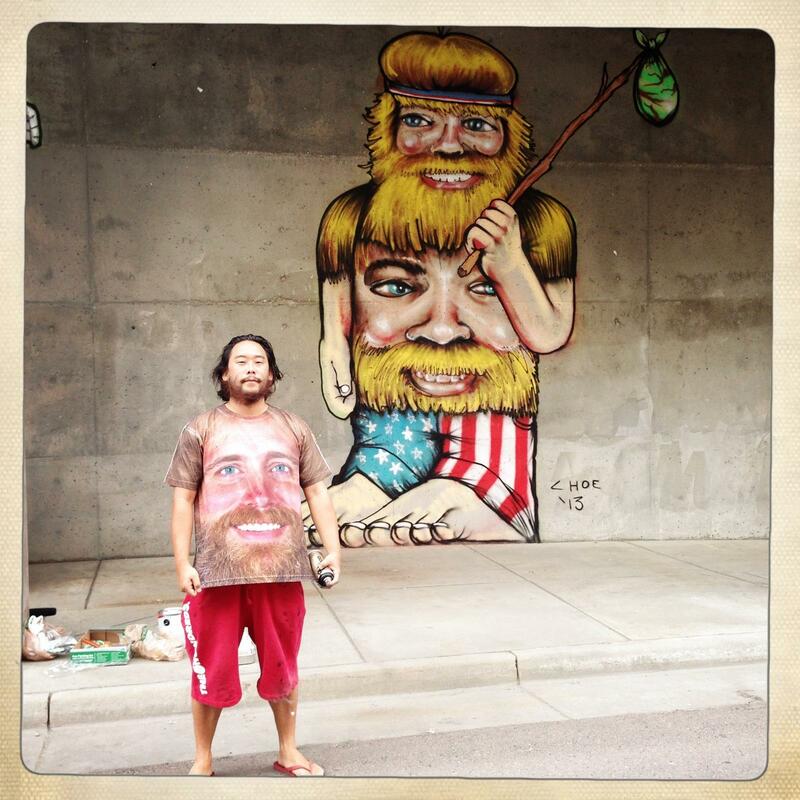 Lo and behold, upon Choe’s latest arrival in Denver he decided to improve his mural. There are Agents in the Poorly Kept Secret Society who continue to be dubious of Mr. Choe’s work. He is an accomplished technician, no doubt. If you gave a can of aerosol to both Choe and an automatic David-Choe-Aersol-Contest-Winning Machine (I believe this is under development by NASA), David Choe wins, hands down. He is also graced with a marvelously ludicrous imagination. But, he is also in that cadre of artists who have come to represent much more than the sum of their craft. Along with the other superstars of the art market, Choe is a symbol of that unattainable corner of the aesthetics. His work is for the wealthy. He, himself, is a multi-millioinaire. He gets lumped with Hirst and Koons and the rest of the superstars. Snore. He is also crass. Or, at least the character of himself that we see on Thumbs Up is. Exclusive and glib; these two traits conspire to make his art feel a bit unapproachable. In real life, Choe is very friendly. The Agents of the Poorly Kept Secret Society who have spent time with David Choe have reported that he is a warm conversationalist. He also commits fully and completely to his art, no pretense. And, the simple, streetwise nature of his aesthetic and the honesty of his narrative are engaging. He seems to resolve any discomfort we may feel with his lifestyle by simply making amazing, beautiful, and engaging works of art. They are indeed for everyone. And, never is that more obvious than in the fact that he has once again given a gift to Denver. If you have not been by the Denver Performing Arts Complex in a while, make the trip. 13th and Champa. Go in disguise, if possible. I love the piece he did near downtown Denver. Hope to get up and see this one someday.